David Eugene Edward's fifth album under the Woven Hand flag is a juggernaut, his most intense and powerful so far and a rival for his finest work with 16 Horsepower. David Eugene Edward's Woven Hand has been on an increasingly rock trajectory lately. His Mosaic in 2006 was considerably more electrified than 2004's Consider the Birds, built on pounding, Joy Division-esque rhythms and slashing guitars, and with only small islands of acoustic respite. 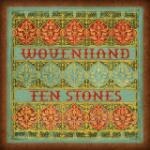 Now with Ten Stones, the fifth since Edwards disbanded 16 Horsepower, the volume and intensity creeps up another notch, in some of the most viscerally powerful songs yet from the Woven Hand catalog. This is perhaps partly due to Edwards' partnership with Sereena Maneesh's Emil Nikolaisen. Like Edwards, Nikolaisen has a fascination with rock rhythms and spiritual striving. He shares Edwards unusual combination of born again Christianity and love of Joy Division. He adds, perhaps, an understanding of the powers of guitar distortion and blur, an otherworldly sheen that encases "His Loyal Love" and other cuts in battings of tranquility or that launches "Not One Stone" from a My Bloody Valentine-esque howl of guitar. And yet, while Nikolaisen may have augmented the force of Edwards' music, there is no sharp break with the past here. Opener "Beautiful Axe" has the turbulent pitch and heave, the internal drama and furious questioning of last album's "Dirty Blue". "Cohawkin Road" vibrates with barely contained intensity, like Mosaic's "Swedish Purse", a quieter, acoustic song that leaves a deep mark. "Iron Feather" revisits the deep trancelike mysteries of "Slota Prow" with its sustained guitars and submerged lyrics. All these songs come from the same well of ideas and preoccupations as prior Woven Hand albums, but they seem subtly larger in scale. Much has been made of Edwards' Nazarene preacher grandfather, one source of the vibrant Biblical imagery threaded through his songs. It is somewhat less known that Edwards had another grandfather, an itinerant entertainer who traveled from town to town with a trained bear, and who may have been just as influential. From him, Edwards learned about Native American myths and legends, which are just as present in his songs. You can hardly listen to more than a line or two without coming on an animal, the horse of "Horsetail", the birds that swarm through "A Beautiful Axe". And then there are the rhythms, far too physical and celebratory for even the most unencumbered church gathering. "Kicking Bird"'s beat is communal and transporting, embellished with group yells and pummeling toms, and surely drawing from Native traditions. It is grafted -- or perhaps grows naturally from -- a foundation of American traditional instruments, not just guitar, bass and drums, but banjo, piano, and accordion, yet it is far wilder and purer and more exciting than most Americana. This album, along with the four that preceded it and the full 16 Horsepower catalog, should establish David Eugene Edwards as one of the truly original and compelling artists in American rock right now. Forget that he's a Christian or an alt.country artist or an odd anachronistic figure prone to old-fashioned clothing, because none of that matters. What matters is that this music is as spiritually engaging and viscerally moving as anything you can hear right now.